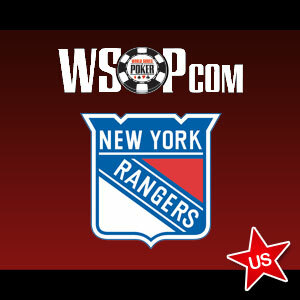 WSOP becomes the second US regulated poker site to align with a professional sports team, the New York Rangers. Nearly two months after Party Poker NJ forged a then historic deal with the NJ Devils and Philadelphia 76ers, WSOP.com is making headlines of its own by becoming the online gaming partner of the New York Rangers. The partnership was originally revealed on WSOP’s promotional page late last week, along with a new promo entitled Ultimate Hockey House Party. Considering that the NHL season is only weeks away from coming to a close, WSOP.com wasted little time crafting a hockey oriented promotion. According to its promo page, from now until April 5th, any player that makes a deposit on WSOP.com and inputs the promotional code NYRANGERS will be automatically entered into a sweepstakes drawing. There are no other requirements for entry. Grand prize winners will be rewarded with a visit by a New York Rangers alumni, as well as $500 worth of merchandise. Eighteen runners-up will receive two tickets to an upcoming home game against either the Hurricanes or the Sabres. They will also be bestowed with additional prizes valued at $120. And finally, 40 lucky winners will receive an official Blueshirts jersey courtesy of the Rangers. In total, WSOP will give away nearly $20,000 in prizes. The drawings for the first home game will be held on April 5th, with other winners being revealed on April 7th. Sweepstakes winners will only have a limited amount of time to claim their reward, typically 24 hours. A free entry is available by emailing your full name, DOB, WSOPCasino.com User name and customer ID…to OnlinePromotions@harrahs.com. Looks like players won’t even have to make a deposit to join in the festivities. The only downside is that players are limited to one free entry each. Is WSOP’s partnership with the Rangers a game changer? Immediately after Party Poker NJ signed an agreement with the Devils / Sixers, the network experienced a notable jump in cash-game volume. However, the upswing was likely due to the widespread marketing blitz that followed the announcement, and not Party’s entertainment themed promotion. Considering that the New York Rangers are barely in a position to make the playoffs, WSOP.com may only have a few weeks to explore the advantages of being buddied up with a professional sports franchise; unlike Party which had a full three months. Factor in the relatively low keyed nature of the promotional campaign and it’s unlikely that WSOP will see anything more than a moderate traffic surge. That being said, the no-strings attached nature of the Ultimate Hockey House Party promotion could draw a wealth of casual poker players. Whereas Party’s Dream Seat Series required players to either win or place high in one or more poker tournaments, all WSOP asks is that players make a deposit. The ease of entry could go a long way towards convincing hockey fans on the fence about online poker to finally give it a go.